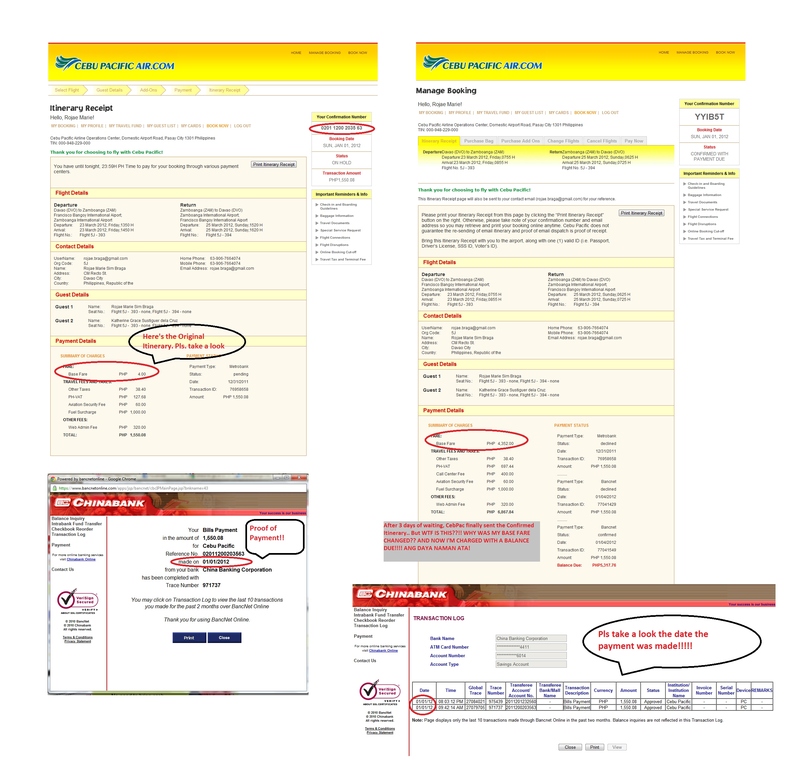 Cebu Pacific Complaint: Fixed | The Adventures of AdventuRoj! Last Jan. 1, 2012 I was able to avail of Cebu Pacific’s Piso fare. How glad I am to be able to pay it on time via bancnetonline.com. It has already been my nth time to CebPac so I didn’t worry much. I’m expecting for the confirmed itinerary to arrive thru my email the next day, as the case of my previous bookings. Dumadating agad kinabukasan ung receipt after the day that I paid. I’ve been waiting for 3 days already and wala pa rin. I’ve been contacting them as well – searched the internet for their email address, emailed them, posted on their FB page, tweeted them, and even called them (and talked with one of their CS who told me to email them again despite of the number of emails that I’ve already sent them). Pero patience is a virtue nga naman daw, so I waited a bit more. Until today came. I checked my email – and found none. I checked my cebpac’s account “Manage booking section” and there it was! My itinerary – finally confirmed! To my surprise when I checked the confirmed itinerary, biglang naging PHP 4,352.00 ang originally PHP 2.00 ko na base fare! Aba ang daya ata! This was the amount that I paid, my online banking transaction even proved it as reflected in the date the payment was made.. Pero bakit ganito???!!! PLEASE EXPLAIN CEBU PACIFIC! LET NOT MY GOOD IMAGE OF YOU BE TAINTED WITH THIS!! *Kakagulat. But when I checked the manage booking section of my account in less than an hour after posting this, there it is.. naayos na. No more payment dues, instead may nakalagay ng “Discount: 4,350” sa aking itinerary. Napaisip tuloy ako, grabe na pala talaga ang epekto ng social media sa mundo natin ngayon.